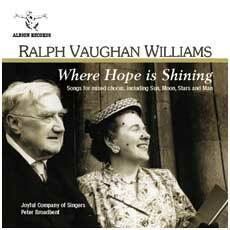 That the vocal works on this recording were composed between 1895 and 1954 shows Vaughan Williams’ lifelong affection for the human voice. As he put it in 1902: ‘The voice can be made the medium of the best and deepest human emotion’. The Joyful Company of Singers is a first-rate ensemble that performs these 23 pieces with utmost respect and artistic authority. … there are many very touchingly beautiful moments – No longer mourn for me; Sweet Day; Willow Song; Rest; Mannin Veen; The New Commonwealth – that seal this program as an essential addition to any serious choral music collection. This selection spans a life-time of creativity. … things of cool lunar delight. … sweetly done … smoothly idiomatic and touchingly reserved effect. … a cooler calorific radiance … an overwhelming and sanguine swing.